1. Does Rigvir® have any side effects? Rigvir is a well-tolerated drug with only a few side effects reported such as fatigue, sleepiness, and slight temperature rise up to 37.5°C. That’s because Rigvir mobilizes your immune system while attacking your cancer cells. The tissues surrounding your tumor are not affected. 2. What cancer types can Rigvir® be used to treat? Rigvir® can be used to treat only solid malignancies. Therefore, blood cancers such as leukemia, lymphoma, and myeloma remain beyond its reach. 3. Can Rigvir® treat cancer in children? Unfortunately, there are no clinical trials conducted that demonstrate the effectiveness of Rigvir® among children. The medicine can only be prescribed to the individuals aged 18 or older. 4. Is Rigvir® registered in South Africa? To date Rigvir® is registered in three countries - Latvia since 2005, Georgia since 2015, and Armenia since 2016. The Rigvir manufacturing company has recently received a grant from the European Commission funding programme to meet a number of criteria and become available throughout Europe. Therefore, healthcare authorities such as the Medicines Control Council (MCC) and Health Products Association (HPA) currently remain out of the focus. For more information about other locations, read about Rigvir in Australia and Rigvir in Romania. 5. Who are the doctors who do the initial assessment of my case? The medical team performing the eligibility assessment of your case consists of Latvia-based doctors with 30+ years of experience in virotherapy.The Chief Oncologist of Latvia is also a board member and often a decision maker in tough cases. 6. How fast can I expect the assessment of my case to be ready? Once you submit the medical documents listed below, it will take between 48-72 hours for the medical team to review your case and email you the results. 7. What documents do I need to submit? Whether you are looking for Rigvir for colon cancer or melanoma, the procedure is the same. 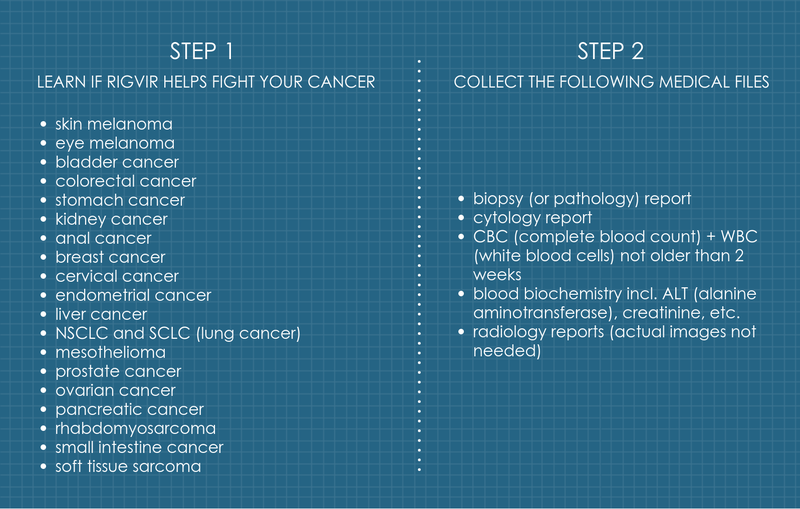 If your cancer type is Rigvir sensitive (please see the list of Rigvir sensitive tumors under Step 1 on the left), take a look at the right column (Step 2). These are medical files you’ll need to submit. If you don’t have all the medical reports and tests mentioned, the medical team will notify you if what you submitted is sufficient. 8. What happens after I submit my medical documents? Your case will be assigned to the medical team of oncologists in Latvia. They will review your case and get back to you within 48-72 hours with the eligibility assessment results. 9. Can I receive Rigvir® cancer therapy in South Africa or should I fly overseas? 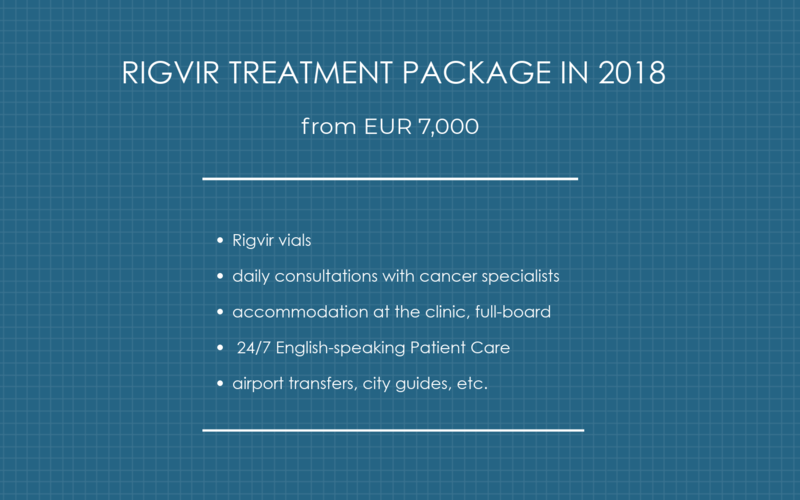 You can get access to Rigvir cancer therapy either in Latvia (inpatient care) or South Africa (outpatient care). If you get approved for virotherapy and are mobile, the Latvia-based medical team will recommend you to complete treatment at the Baltic Coast. 10. I have never been to Latvia. How long does it take to get there and what’s the price range? To get to Riga, Latvia’s capital, you will need to make a stopover in Amsterdam, Paris, or Frankfurt. For example, the total cost of your one-way ticket from Johannesburg to Riga makes around ZAR 12,300.00. The English-speaking driver will meet you at the airport and bring you directly to the clinic. The 3-year survival rate in patients with melanoma treated with surgery as the only method was 46-58%. Melanoma patients that were treated with both surgery and Rigvir® featured a three-year survival rate of 57-84% and a five-year survival rate of 44-66%. The 3-year survival rate and five-year survival rate in patients diagnosed with eye melanoma made 90% and 70%, respectively. The 5-year post-surgery survival rate in patients diagnosed with stage 3 stomach cancer was 24-33%, compared to 47-60% for patients who received therapy with Rigvir®. The 5-year post-surgery survival rate in patients diagnosed with stage 2-4 rectal cancer was 41-68%, compared to 71-78% for patients who received therapy with Rigvir®. Rigvir is far from being an all-purpose drug. If it turns out during the initial assessment of your case that you cannot benefit from Rigvir cancer therapy, the medical team will immediately notify you about it. We understand that you still have questions about Rigvir cancer treatment in South Africa. Please fill out the form on the right and we’ll get back to you with further instructions within 24 hours but normally much sooner.